QVC Air Fryer Reviews: What Is It And How Does It Help? Home Reviews QVC Air Fryer Reviews: What Is It And How Does It Help? French fries, fried chicken, fried fish, chicken fried steak… It’s not difficult to tell what these foods have in common. It’s in their very names: they’re all fried. There’s no denying it, fried foods are delicious… and unfortunately dreadfully unhealthy. All that oil can turn any traditionally healthy food into an unhealthy yet delicious abomination. But unless you practice a very healthy diet, you are likely hooked on fried foods along with the rest of Americans - despite your awareness that it’s no good for you. Worse than regular frying is deep frying, which provides full and deep submersion in oils during the cooking process. But there is. Air fryers are becoming increasing common, leading one of the most popular health trends of the year. That’s because air fryers use air to fry food rather than copious quantities of oil, so you can enjoy your crisp and flavorful fried food without worry. Below, we’ll be reviewing the collection of air fryers available for purchase from QVC (Quality Value Convenience), a television network and online retailer that specializes in and offers home goods. It is our goal to provide you with as honest and unbiased information as possible when it comes to these QVC air fryers, so that when purchase time rolls around you can make a confident and informed decision. What are QVC Air Fryers and How Do They Work? As mentioned above, QVC air fryers work by frying food with air rather than oil. But how exactly does this work? Air fryers use quick and targeted air that’s heated in order to cover and heat your food from all angles. So, instead of submerging your food in heated oil, you’re essentially submerging it in heated air. This air covers every surface of your food just like oil does, and the even heating provides your food with the crisp quality of fried food that makes it so desirable in the first place. Air fryers do use oil—but only a very small amount, such as a tablespoon, rather than the full submersion required for deep frying. 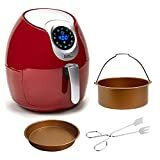 What Make QVC Air Fryers Unique? So, we’ve seen what makes an air fryer different from a deep fryer, but what makes it different from your typical oven? Truth be told, air fryers are actually more similar to ovens in some regards than to deep fryers. This is because ovens also use heated air to cook food. How this air is utilized, then, is where the differences shine through. While the heated air that ovens use is not necessarily stagnant, it is far stiller than that used in air fryers, which is rapidly moved around to tackle the outside surface of food from every angle. Cooking food in an oven, therefore, actually takes significantly longer and doesn’t result in the same fried texture we all know and love. What Food Can Air Fryers Fry? The answer to this question is… basically anything. Just like how you can deep fry anything within your imagination, so can you air fry it. 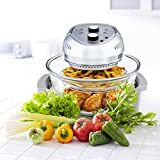 Air fryers are particularly great for making French fries, crisping vegetables, and making that classic fried chicken. So, enjoy all your fried favorites without turning them into a feast of fried unhealthiness. Unless you’re frying Oreos and Twinkies. Those will still be pretty unhealthy. Though air fryers are typically available in a pretty wide price range, their common and deluxe features are pretty common. Basic air fryers contain a fry basket, while some higher-end models may contain additional features such as a cake tray or toasting option. These QVC air fryers typically have different preset frying modes based on common food types, so you can get exactly the right crispiness level you desire while still having a thoroughly cooked and hot inside. These products also frequently sport touch control panels. Air fryers are available in a variety of sizes, so this is something you should really investigate before purchasing—you don’t want to expect an appliance capable of feasting the whole extended family in one go and end up with something just made for a select few. This QVC air fryer offers space of up to 3.4 qts and up to 1500W of power. It uses “Rapid Air” circulation technology to thoroughly cook food and the fry basket is dishwasher safe. It offers a timer that will run for up to 30 minutes before automatically shutting off, so you don’t have to worry about any dangerous over-cooking. This egg-shaped product is available in eight different colors, so it can match any kitchen color scheme. Most users love this little air fryer for its easy usability and the great-tasting food it makes. There have a been a few complaints of the non-stick material flaking off, however, some customers suggesting buying a more expensive, stainless steel appliance. Others also dislike that it can only be operated on non-flammable surfaces. This air fryer offers a few more customization options than the Cook’s Essential product discussed above. For starters, there are seven different customized cooking modes for fries, shrimp, roast, poultry, steak, fish, and baked goods. In addition to a frying basket, this Power Air Fryer also offers a cake pan and grill rack. It offers 1600W of power and manual temperature control along with a timer. It also features a touchscreen control panel. Reviews for this product are overall positive, but there are a few complaints of plastic occasionally melting. Buyers also dislike the small amount of cooking space compared to the overall large size of the product. This product is technically a toaster oven, but it can also function as an air fryer. Because of this, this is a very diverse product that is great for any occasion, so long as it’s on a smaller scale. 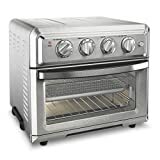 It offers seven distinct baking modes: air fry, convection bake, convection broil, broil, warm, toast, and bake. It offers 1800W of power. Proponents of this product really seem to love it. So much so, in fact, that they claim that those who suffer from the common problem of their air fried food burning are simply suffering from operator’s error. 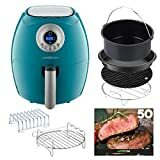 Other top-rated QVC air fryer products include the Philips Avance Digital Air Fryer with TurboStarTechnology ($249.99), the Kalorik 3.2-qt Air Fryer with Dual Layer Rack ($89.99), and the Delonghi MultiFry, Air Fryer and Multi-Cooker ($220). These products are all pretty highly praised for the food that they make, though again, pay attention to size: you want to be able to make the amount of food you want but also be able to fit it on your kitchen counter. When looking into individual products, you should make sure to review all of their individual features. The Delonghi product, for instance, doesn’t offer an included timer, so you really have to watch your food. You probably got a good sense of the general price range of QVC air fryers from comparing the products listed above, but we’ll sum it up a little more thoroughly here. You can find an air fryer on the QVC website for anywhere from $50-$300. In most cases, the main differences between the lower and higher priced air fryers include different cooking modes and options available, as well as the material the appliances are made out of. For instance, most of the cheaper appliances are made of plastic rather than steel or another metal. Public perception of the QVC air fryer products are overall pretty positive, though approval ratings of course vary between individual products. Users love them for the delicious fried food that they are able to make with far less oil, creating overall healthier fried options with less necessary cleanup. The main complaint about these products is that they tend to take up a lot of counter space without actually offering that much room for cooking food, so making food for a group of more than two adults all at once can be a challenge. Multipurpose air fryers are also popular, such as the joint toaster oven/air fryer detailed above. Many air fryers also come with a helpful recipe book so you can take full advantage of your new appliance. Many of these air fryer products, like other products offered by QVC, have been tested and demonstrated on QVC programming, so you can see for yourself how the products work before purchasing yourself. Now that we’ve expolored the QVC air fryer products, let’s compare them to a few other air fryer products on the market available from other sources. Below, we’ll be comparing the QVC selection to the Big Boss 16 Liter Oil-Less Air Fryer and the GoWISE USA GW22652 2.75-Quart Air Fryer. This air fryer’s design is a bit different from the other air fryers mentioned earlier, even those that function as another kind of cooker. This is because food is cooked in a large glass open-topped bowl which the heating mechanisms hang over. This design allows for a larger space with which to cook food while at the same time granting a smaller product space overall, which is ideal for operating on a counter top. This air fryer cooks your food using three different heating methods: a halogen heater crisps the outside, while infrared and convection heaters cook the inside. This product is made of stainless steel, glass, and aluminum, while products of a similar price range available on QVC are typically made of plastic. The base of this product, however, is made of plastic. Reviews for this product are overwhelmingly positive. Users love the food, and they also love the size, which is a problem for many other air fryers. There are reports of the occasional defective product, so you may want to consider purchasing the warranty protection plans available (one year for $6.99 or two years for $7.99). This air fryer’s design is much more similar to the majority of the other air fryers we looked at with QVC. It has a plastic casing that surrounds its fry basket. Its initial size is 2.75 qts, which is rather small. It is also available, however, in a 5.8 qt size. This air fryer also uses rapid air technology to cook food, like the QVC air fryers. It also has a manually-set timer, so you can easily keep track of how long your food has been cooking. Users of this air fryer state that the food it makes is fantastic, but that the usability of the product unfortunately doesn’t hold up for very long. Users complain of the nonstick surface of the frying basket flaking off after only a small amount of use, a complaint QVC’s Cook’s Essential Air Fryer also suffered from. Other problems with general functioning have been reported as well. There seems to be a pattern of the appliance working great for the first few months, then suddenly and severely declining. Still… that’s what warranties are for, right? While the appliance as a whole has a one-year warranty, though, the frying basket has a warranty of only 30 days. So, what’s our final verdict when it comes to QVC air fryers? The sheer range and scope of products available make it hard to generalize, but overall these seem to be pretty good products. As with anything, you might need to watch out for the cheaper products, which lull you in with their cheap prices but then quickly start to degrade. The QVC air fryers, though, seem to hold up pretty well for the most part. With such a wide range available, you can be sure to find something in your price range, and maybe even something with a few bells and whistles, too.